Making social networks work inside companies is a difficult task. Who wants to update their “status” to tell everyone what they are working on, or have to tag things manually? We’ll do that for our friends on Facebook, but for our co-workers on the terrible ‘knowledge management’ system the company installed? Not so much. But the space is hotting up. BEA Systems launched a social network for enterprise platform recently and Oracle’s AppsLab is working on a social network internally. But much of the intelligence in the system requires employees to so the heavy lifting, which is boring. So at Web 2 Expo this week, Trampoline Systems, the UK-based enterprise startup, launched its new Sonar Dashboard tool designed to be a “Facebook for the enterprise”. This allows employees to create profiles, watch a news feed of colleagues’ activity and use a contacts list. Dashboard automatically tracks employees’ everyday work activity, such as email. 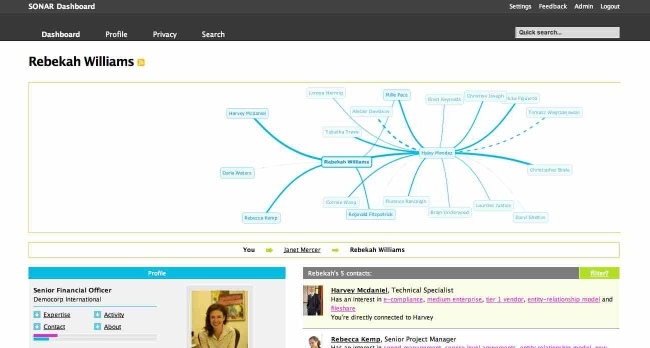 Their Sonar Server product analyzes the social graph, information flows and expertise hidden within the company, allowing users to work out who in the company can help them, across departments and geographies. Sonar Dashboard makes the network searchable, and gives visibility to the right people via a simple visualization tool that maps the user’s social graph. Users can completely control what they share (the system automatically filters out blatantly personal material) and also lets them work out what they themselves are most preoccupied with. I haven’t seen a product like it so far and the visualization tools are pretty amazing. See TechCrunch UK for a longer review. Trampoline raised $6.8 million from Tudor private equity.